Garage floor coverings come in two styles—mats and tiles. Both are extremely easy to install and are ideal products for the DIYer. This article will look at the pros and cons of garage floor tiles. For a discussion of floor mats, you should look elsewhere. There are three basic types of garage floor tile—rigid plastic tiles, flexible rubber, and plastic tiles and wood composite tiles. 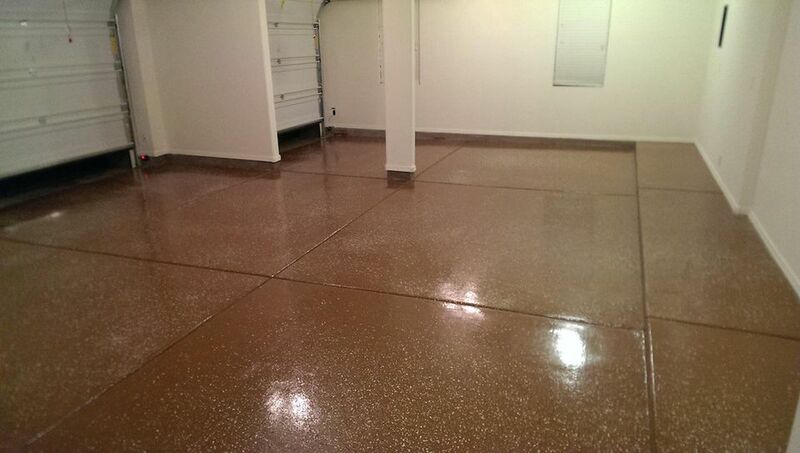 Each type can create a great garage floor, but their differences are worth considering. Garage floor tiles come in sizes from 12x12 inches to 24x24 inch. They generally snap together and are as easy to remove as they are to install. One great advantage of tiles is that you can create attractive patterns, such as checkerboard, on your floor. Another is that the tiles can be installed over cracked or stained concrete floors with no need for repairing the floor first. A major disadvantage of garage floor tiles is cost: prices generally start at about $2.50 per square foot and rise from there. This is more expensive than garage floor epoxy or garage floor paint, but the trade-off is that installation is much quicker and easier. The best rigid garage floor tiles are 100 percent PVC. They are usually about 1/4-inch thick and can stand up to most chemicals, oils, grease and other nasty substances found in a garage. They are strong enough to support cars and car jacks. And if you have any questions about that statement, check with Jay Leno. Some of the vintage cars in his Big Dog Garage collection rest their high-priced tires on Swisstrax garage floor tiles. One other, high-end, option in rigid garage floor tiles is XFloor - Xtreme Modular Metal Floor Tiles, which have a metal tread surface. It’s tough and offers a unique look, but it is also quite expensive: about $10 per square foot. There is a variety of interlocking flexible garage floor tiles. Like rigid plastic, these softer tiles are easy to install and remove. One of the major advantages of flexible garage floor tiles over rigid tiles is that they are much easier to stand and walk on over long periods of time. Some types of interlocking rubber tiles are made for use in family rooms and daycare centers. They can handle a lot of abuse and clean up easily, but they may not be suitable for use under cars and other heavy machinery. They do, however, make nice, comfortable flooring around a workbench. Flexible PVC tiles, on the other hand, are usually perfectly suitable for normal garage use. Wood composite tiles such as DRIcore are specifically made for basement subflooring systems, but they can also be used as garage flooring. The wood composite tile has a polyethylene moisture barrier on the bottom that keeps the top dry. Dricore panels can be used instead of subflooring techniques that utilize sleepers or plywood. One big advantage DRIcore offers over these other materials is that it is only 7/8-inch thick. The manufacturer claims the panels can support up to 4,000 pounds per square foot, which is plenty of strength for standard garage purposes. The 2-square-foot panels weigh about 8 pounds each. They are very easy to install: panels have tongue-and-groove edges that snap together with a hammer and block of wood. No gluing is required or even recommended. DRIcore can be cut with any woodcutting saw. Wood composite garage floor tiles are designed to expand and contract with climate variations, so it is recommended that you leave a 1/4-inch expansion gap around the wall edges. The manufacturer recommends that for garage floors the leading edge (that is, the row of panels closest to the garage door), should be fastened to the slab with concrete screws (such as Tapcons), with a transition strip in front to protect the edges. You can watch a video on installing DRIcore here. Since DRIcor is intended as a subfloor, the top surface is not very well protected. You can cover it with just about any type of finish floor surface or coat it with oil-based floor paint (not water based) or polyurethane. DRIcore may not be easy to find, however. While it is stocked in some home improvement centers, at other stores, you may need to place a special order. Cost is generally under $2.00 per square foot.